Converting a Refrigerator to a Kegerator! For the last several years, I have been using a plane old refrigerator to store my kegs and have been serving my beer from picnic \ cobra taps. A couple of weeks ago I decided to take the keg fridge to the next level and convert it to a full fledged Kegerator! After ordering some parts from MoreBeer and taking a trip to the local hardware supply shop, I had everything that I needed to begin my work. My goal is to list out all of the basics of what you will need to conduct the process yourself but I am sure to miss something and if you need any specifics please feel free to ask; I am happy to help if I can. Also, please keep in mind that I am not a carpenter, engineer or machinist; so there are probably 10 better ways of doing this, I am just trying to share my experience in case it helps someone else out. Step 1 – Ordering your gear! I figured that if I am going to take the time to do this project, I was going to do it right! Recently MoreBeer started to carry Intertap stainless steel beer facuets – tap, which are basically the Holy Grail of beer taps! Intertap Stainless Steel Beer Taps and Beer Faucets! I chose these intertap beer faucets for a few different reasons. For one, they offered an all stainless steel faucets which is important to me because I want it to last, I want it to be sanitary and I do not want it be releasing strange metallic particulates in to my beer. These Intertap beer faucets are also forward sealing and in forward-sealing faucets the faucet keeps beer in it so the inside doesn’t have a chance to get sticky, making cleaning much easier. 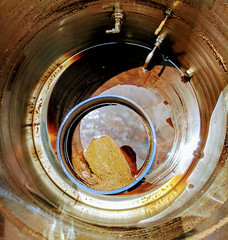 It also reduces the chance of off flavors transferring to your beer while you pour. One of the things that sets Intertap beer taps apart from other forward sealing taps is that Intertap faucets use a sliding shuttle that guides the o-ring into the perfect position every time. The Intertap stainless steel faucets are also modular allowing you to add helpful items like a ball lock spout, growler filling spout and a stout beer spout! They have two varieties in all stainless and 1 features a flow control lever. I ended up getting 1 flow control faucet and 3 standard stainless steel faucets. MoreBeer has the best price I have found for Intertap Faucets and also offers fast free shipping on orders over $59. Here are links to them as well as links to the anti-microbial beer line which I also highly recommend. Do not forget to pick a shank for each beer faucet, I got the 4″ shanks and they have me plenty of extra room to run them into my refrigerator door. Those were the items that I picked up at MoreBeer, the remainder I purchased at my local Lowes. I purchased 1 box of Stainmaster Luxury Vinyl flooring, which is great because it is resistant to liquid and stains. Normal wood flooring does not do well with moisture so I would recommend avoiding it if possible. I picked up a small container of vinyl flooring adhesive, a plastic spreading knife, a razor blade cutting knife (to cut the vinyl), a 1″ drill bill to cut the shank holes for the beer taps, chalkboard spray paint (for the refrigerator upper door), a 3″ wide plank of wood (to make a frame for the upper door), some wood stain to match the floor, black duct tape for trim and a brushed aluminum (that looks like stainless steel) kick plate to put on top of the vinyl but under the taps. So once you have all of your supplies, it is time to get to work! I started off my shutting off the refrigerator and giving it a good cleaning. I then removed both of the refrigerator doors and all of the handles and hardware. I then lightly sanded the refrigerator doors with a high grit sandpaper to make them more receptive to the vinyl adhesive and chalkboard spray paint. I then measured and cut the flooring so that it would fit my refrigerator door. After making all of the needed cuts, I applied the adhesive to the refrigerator door, waited approximately 10 minutes and began to place the vinyl planks. Placing the vinyl flooring on the refrigerator door. The vinyl flooring planks were very easy to install and locked in to place with one another forming a strong bond. After placing all of the vinyl wood planks, I put it to the side to allow it to dry. I then began work on painting the upper door, building the wood frame and getting the mash paddle door handle ready for the kegerator. I figured that I would paint the upper door with chalkboard spray paint since it would add some contrast to the kegerator and also give me the option of adding some notes about the beer being served or allowing me to change the appearance of the fridge by changing up what was drawn on the board. Painting the door was easy and I gave it two coats of paint. After the door was painted, I began my work on creating a simple frame to give it a border and add some cohesion with the rest of the kegerator. I got the cheapest 3″ wide plank I could find at Lowes and had them cut it to the appropriate sized cuts which they are always kind enough to do for free. I joined the pieces together with some wood glue and staples. I was going for a rustic look so was not too concerned with any rough edges or the staples showing. I then stained the wood and applied a clear acrylic coat once it had dried. Next up was crating a door handle. I wanted to use something that said beer or homebrewing when you looked at it! I decided to use an old mash paddle that I had hanging around the garage and am really pleased with how it worked out. I started by staining the mash paddle so that it would contrast the wood on the doors but compliment the beer tap handles. I then drilled the mounting holes and used a cork as a spacer so that the top of the handle would have a couple of inches of space from the door. Once that was completed I mounted the doors back on the kegerator once I had verified that the flooring had adhered well enough and the paint had dried. Next I installed the brushed aluminum kick plate after cutting the excess metal with a pair of tin snips. I placed the kick plate in the center of the area where I was planning on installing my beer taps. I simply drilled it in with screws that would be long enough to make it into the door but not too long to pass in to the interior of the keg refrigerator. Once that was done, it was time to install the frame for the upper door which I did with 4 screws. I then mounted the mash paddle kegerator door handle and applied some vinyl octopus decals that I picked up online. It was then time to install the beer tap shanks! I drilled pilot holes and then used my 1″ drill bit to cut the 4 holes for the tap shanks. If I had this project to do over again, I think I will have switched drill bits to a 1″ saw style bit. If I had, I think the holes would have been a little cleaner. If you are like me and do not have room to fit your CO2 tank in your kegerator and or do not want to store your CO2 tank in the fridge then you will need to drill a passage hole in the door. I did so with a 1/4″ stainless steel pipe and brass fittings. 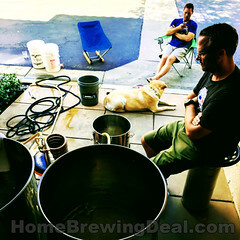 At this point all of the hard work is behind you and you are probably ready for a beer! Clean up the mess that you have certainly created when drilling in to vinyl and Styrofoam and then slide the shanks in to the holes and tighten down the bolts on the inside of the kegerator. Once tightened, you can install the beer taps – faucets on to the front of your kegerator and then attach your tap handles. 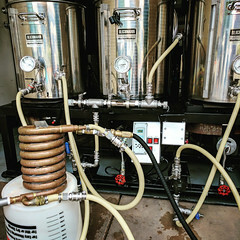 All that is left is to connect the kegs, test for leaks and you are ready to enjoy a nice cold beer! 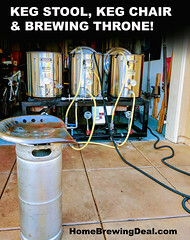 Hopefully this help some of you and if you have any questions or suggestions about converting a beer fridge in to a kegerator, please feel free to reach out! I just saw the additional beer opener to the right of the stainless steel taps. That is the perfect addition! This really does look amazing. Awesome job, thanks so much for the post on your kegerator.